The movie is heartbreaking and done really really well (Meryl Streep is incredible), so if you want to see it afterwards I'd totally recommend it! Drat! I picked it up for like $3 on my Kindle, so if it's not awesome I can deal. I have a copy of Heartbreaking, too, but The Circle is first on my TBR for Eggers! You have a great selection of books here. I've read only Life Itself (I'd pass) and The Bridge of San Luis Rey which is worth the read. I've heard mixed reviews on Life Itself, which totally bums me out but I think I'm going to read it anyways (I have a copy and I do enjoy his writing voice). Bridge of San Luis Rey I've heard is a quick read but a powerful one! 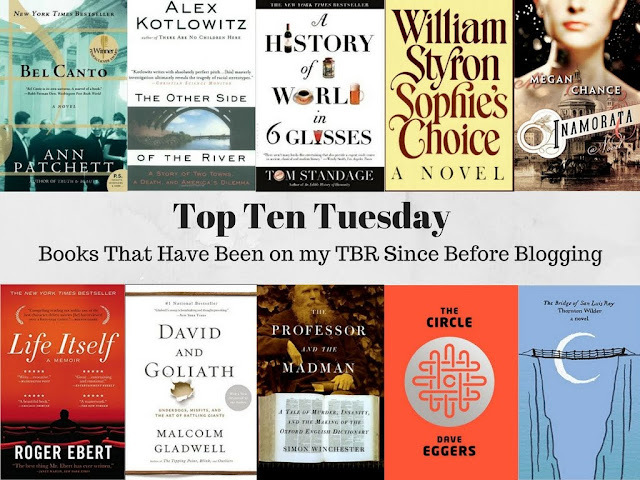 David and Goliath is one that I have had on my TBR list for some time! His books are always interesting. I have read The Professor and the Madman. It was interesting, though parts were a little weird. It is still an interesting bit of history though. I'm interested to read my first Gladwell! My husband listens to his podcast and loves it. I really enjoyed David & Goliath...and kind of love most anything Gladwell! However, I was underwhelmed by Bel Canto, but I loved Patchett's State of Wonder. And am planning to read her new one coming in Sept, Commonwealth. If I don't have luck with Bel Canto, I'll have to check out State of Wonder then! Thanks for the rec! Gladwell is such a popular author, I'm really looking forward to finally reading one of his books and (hopefully) finding out what all the fuss is about!